Mark your calendars now for the end-of-year faculty meeting. More details to follow in the coming months. A celebratory lunch will be held with faculty and staff, following the end-of-year faculty meeting. Topics will include professional identity construction, student motivation and confidence in ePortfolio usage, the development of self-directed learners, and information literacy assessment. In addition to briefly highlighting methodology and findings, each author/presenter will conclude by sharing the practical implications of their research in higher education settings. Those who attend this webinar will leave with research-informed practices that can guide the next steps they take with ePortfolios on their campuses. This webinar is made available through our AACU membership and will be broadcast in one location. Vanguard UniversityKerr Peirce Smith Conference Room55 Fair Dr. In the summer of 2018, a group of Vanguard faculty had the opportunity to attend a Summer Institute on Scientific Teaching at the University of California, San Diego. This year, the same program is happening and a team from VU will once, again, participate. 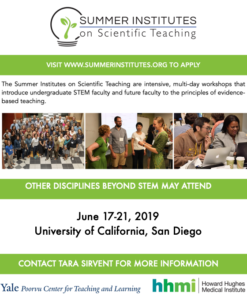 The Summer Institutes on Scientific Teaching are intensive, multi-day workshops that introduce undergraduate STEM faculty and future faculty to the principles of evidence-based teaching. You do not have to be a STEM faculty to attend. Last year, they had a philosopher and are continuing to expand who is eligible to join in the foundation-funded program. Contact Tara Sirvent to learn more and express your interest. Note: this is a multi-day event. Check additional event listings for times and locations.